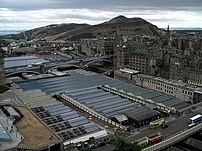 The UK e-science All Hands Meeting (AHM) 2008 is currently underway in Edinburgh. I will not be taking notes via this blog, instead I will be microblogging via my FriendFeed. Other delegates already on the FriendFeed band-wangon are Daniel Swan and Jean-Claude Bradly. Hopefully by the end we will have some more e-science FriendFeed converts. I will also be tagging AHM relevant posts via delicious using the tags e-science+AHM+ 2008.